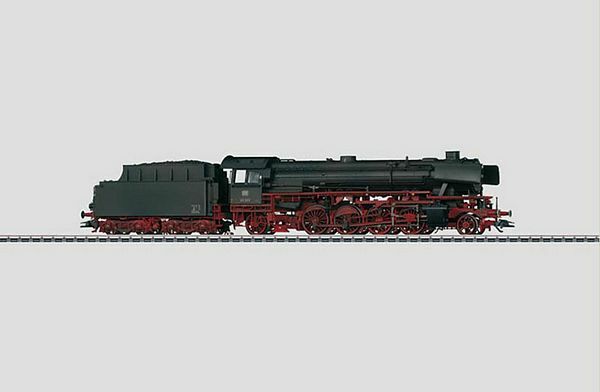 Marklin 37922 German Federal Railroad (DB) class 41 freight steam locomotive with a tender and coal firing. Rebuilt version locomotive with new design, high-efficiency boiler, type 2�2�T34 coal tender, Witte smoke deflectors, DB Reflex glass lanterns, inductive magnet on one side, and buffer plate warning stripe. Road number 41 069. The locomotive looks as it did around 1960. This is the 37922 German Federal Railroad (DB) class 41 freight steam locomotive with a tender and coal firing. Rebuilt version locomotive with new design, high-efficiency boiler, type 2Z2ZT34 coal tender, Witte smoke deflectors, DB Reflex glass lanterns, inductive magnet on one side, and buffer plate warning stripe. Road number 41 069. The locomotive looks as it did around 1960. Model: The locomotive has an mfx digital decoder and extensive sound functions. It also has controlled high-efficiency propulsion with a bell-shaped armature and a flywheel, mounted in the boiler. 4 axles powered. Traction tires. The locomotive and tender are constructed mostly of metal. A 7226 smoke generator can be installed in the locomotive. The triple headlights change over with the direction of travel. They and the smoke generator contact will work in conventional operation and can be controlled digitally. The headlights are maintenance-free warm white LEDs. There is a close coupling with a guide mechanism between the locomotive and tender and it can be adjusted for curves. The front of the locomotive and the back of the tender has a close coupler in an NEM pocket with a guide mechanism. Minimum radius for operation is 360 mm / 14-3/16". Piston rod protectors and brake hoses are included. Length over the buffers 27.5 cm / 10-13/16". First steam locomotive of a series of locomotives with authentic weathering, exclusive for the MHI. The Class 41 The locomotive building industry developed the class 41 2-8-2 locomotive for fast freight trains as part of the DRG's standardized locomotive program. Schwartzkopff delivered two sample units in 1936. The frame was a new development; the boiler was the same as on the class 03, but was designed on the class 41 for 20 atmospheres or 290 pounds pressure per square inch. The axle load could be set at 18 tons or 20 tons per axle. The resulting class 41 was for the first time a general-purpose locomotive that could be used anywhere. The two pre-production units were followed by 364 regular production locomotives that were improved somewhat and that were delivered by almost all of the German locomotive builders by 1941. These locomotives could run at 90 km/h or 56 mph and had 1,900 horsepower; they were used almost everywhere. After World War II there were 216 locomotives on the DB's roster. It was soon found out that the type St47K boilers were worn out. Since the class 41 was indispensable, the DB developed a completely welded, high-performance boiler with a combustion chamber. Compared to the previous long tube boiler, this version had a higher ratio of premium radiant heating surface and could therefore support a greater load. Between 1957 and 1961 a total of 102 class 41 locomotives were equipped with this new boiler at the maintenance facility in Braunschweig. Together with the front skirting being removed, this resulted in a considerably new look for the class 41 locomotives. 40 of these converted locomotives were also equipped for oil firing. The last grate-fired converted units were retired in 1971. An auto transport car set to go with this freight steam locomotive can be found under item no. 45098. This model can be found in a DC version in the Trix H0 assortment under item no. 22928.